There is a realm of food-stuffs, and all cultures have them, that are cheap, always satisfying and something you don’t often make at home. For New Yorkers it might be that perfect egg and cheese sandwich on a roll from your favorite bodega. For Texans, maybe BBQ brisket, juicy and smoky. For Egyptians, koshari. All these foods exist as a perfect thing at the exact moment that you crave them. It is no wonder that for the past 20 years classically trained chefs have examined these foods and said…”What if we took these simple classics and applied real technique and used only the finest ingredients in making them?” The result has been Truffled Mac and Cheese with Lobster, the $100 burger and many other permutations – some laughable and some delicious. For Japanese, Ramen is that dish — some people prefer Soba and some Udon, but everyone loves Ramen. Brought to Japan by Chinese immigrants in the early 20th century and gradually adapted and stylized for Japanese tastes, it is the dish that you very well might order on your way home from an expensive Kaiseki meal. For decades Ramen shops reflected their humble origins — they were ramshackle affairs with steamy windows, cracked linoleum and staffed by old guys smoking cigarettes or middle-aged Chinese women with the legs of someone who made that long march next to Mao Zedong. Pretty soon the folks who dined at these humble spots noticed whose broth had particular depth, whose noodles just had that mouth feel, whose pork was the most tender and they passed that knowledge to their children and a few generations down those grand-kids — imbued with ramen knowledge and lust — wanted to see this humble dish elevated to a status that reflected its complexity. 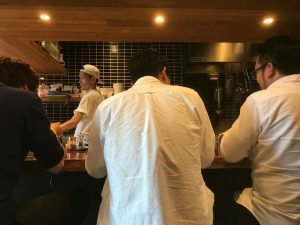 They built temples to Ramen — clean spaces, hushed and reflective and amped up the quality of ingredients — the finest pork, farm raised eggs and no MSG. 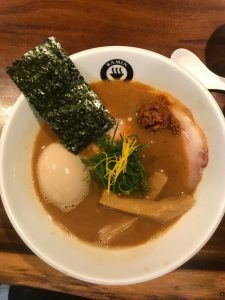 They created New School Tokyo Ramen and unlike their New York City bredrin, they did not go overboard with price. 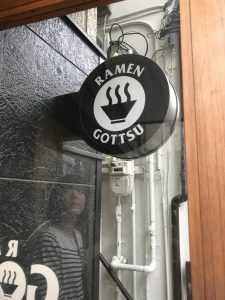 Ramen Gottsu is the epitome of New School Tokyo Ramen. It is located on a quiet side street — opposite a work-wear shop — right off Nerima’s main commercial drag. A long line had already formed when my kids and I approached by bike. The people waiting were cool and young and fashionable — a willowy Chinese couple in their early 20s wrapped in selvedge Denim and T Shirts whose very fit betrayed real expense; a group of four bespectacled men (architects maybe?) silent in anticipation. Nowhere were the cab drivers, the construction workers with heads wrapped in towels and the old men whose presence once signified a great bowl of noodles. These were Ramen Travellers, folks who (like me) had read the blogs, the reviews and the Michelin guide notes proclaiming a great bowl of Ramen was to be had. Gottsu is beautifully designed with an interior that somehow combines Japanese minimalism with the warmth of an old-fashioned soda fountain shop. Ten stools around a L-shaped bar built of dark, warm, possibly salvaged natural wood. A carefully restored water spigot. A glass jar full of lollipops. The atmosphere was hushed, noodle slurps punctuating the silence. Serious people eating serious noodles including a duo that wrapped themselves in some sort of Ramen-Eating Bib before tucking into their dishes. Two chefs carefully put together the ingredients in custom-made tall, angular bowls employing tweezers to arrange the toppings of yuzu and seaweed. The pork was paper-thin, thanks to a meat slicer, and slightly pink as it hit the blazing hot broth. The bamboo shoots, tender and flavorful, were thick planks like a carrot stick. We were presented with a Ramen that looked like art. I wish I could have enjoyed it more. Maybe it was just not my type of Ramen? The noodles were thinner than what I like and the broth was fish based — redolent of dried bonito and anchovy — where I typically like a straight pork or chicken. The egg though, that was a thing of beauty: rich with flavor and a melting yolk that creeped out when pierced with a chopstick. But maybe it was the seriousness of the spot that got to me? The reverence. The hushed silence. No disrespect to the owners though, they were warm people, cutting against the pretension of their tweezers and “No MSG” shirts with genial smiles, a reasonable price-point ($8.50 for the house special) and a lollipop handed to my daughter. 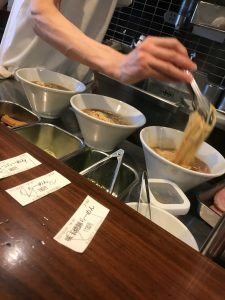 But, there was a weightiness to Ramen Gottsu, a stiffness that runs counter to my Ramen enjoyment — Maybe I don’t want to be so aware of the art of ramen and the skill that goes into it? Maybe I just want to enjoy the soul of it. The knowledge that what I am enjoying with such ease came from tireless repititon earned over countless years. I want to blow my nose as I slurp my noodles, I want the windows steamy, I want everything to be fast but not feel hurried — I want a little more joy in my noodles without the side-dish of preciousness that I have come to find in Gottsu and many a new school Tokyo Ramen. When pressed, I just might like cracked linoleum more than recycled wood. Brilliant prose. I share your sentiments. I long for a pastrami sandwich served by a grumpy waiter in nondescript surroundings. Chinese food under bright lights (and cracked linoleum). Italian food in a red sauce joint with a pitiful mural of the Bay of Naples on the wall. Down home funk triumphs.